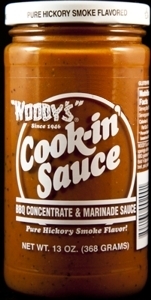 "WOODY'S"® Cook-n' Sauce was introduced to the world in 1946 when Woody Morse produced his first jar of sauce. Since then the loyal "WOODY'S"® faithful have been rewarded with a rich hickory sauce that cooks in and through the meat without burning like some of its competitors. 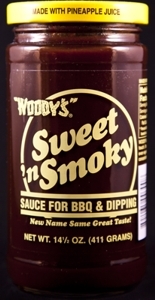 "WOODY'S"® unique flavor of sauces are perfect for steak, brisket, chicken, ribs, hamburgers, pork chops, roast, turkey, chili, casseroles, baked beans, meatloaf, fajitas, ham, shrimp…….even fish! Great for any cooking occasion outdoors on the barbeque or indoors in the kitchen! 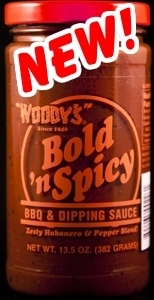 "WOODY'S"®< is the preferred BBQ, marinade and dipping sauce! For sensational "WOODY'S"® classic recipes CLICK HERE. A Bold and Spicy sauce, there is nothing else like it!